Major Jack Novak has never failed to meet a challenge--until he meets army nurse Lieutenant Ruth Doherty. When Jack lands in the army hospital after a plane crash, he makes winning Ruth's heart a top priority mission. But he has his work cut out for him. Not only is Ruth focused on her work in order to support her orphaned siblings back home, she carries a shameful secret that keeps her from giving her heart to any man. Can Jack break down her defenses? Or are they destined to go their separate ways? A Memory Between Us is the second book in the WINGS OF GLORY series, which follows the three Novak brothers, B-17 bomber pilots with the US Eighth Air Force stationed in England during World War II. 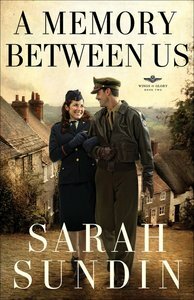 About "A Memory Between Us (#02 in Wings Of Glory Series)"
Sarah Sundin is the author of A Distant Melody. Her great-uncle flew with the US Eighth Air Force in England during WWII. Sarah lives in California with her husband and three children. Customer Reviews For "A Memory Between Us (#02 in Wings Of Glory Series)"
This heart warming story of a proud soldier and a resilient nurse is an excellent example of 3 of my favourite genres: Historical fiction, christian literature and romance. Sundin has a way of creating such likeable characters that you feel as if you know them personally by the end of the novel. I'm looking forward to more books by this talented author. I really enjoyed Sundin's previous novel (her first) and looked forward to reading this one. I'm impressed with the level of research that has gone into her descriptions of air battles, as well as a great storyline that moves along well. I found this one a little more believable than the last. A great new author to add to the ones I 'look for' in the store. High on morphine and with a backside full of shrapnel, brash and handsome Major Jack Novak impulsively proposes to his nurse at first sight. But disciplined Lieutenant Ruth Doherty, who also nursed Jack's younger brother, Walt after his amputation, doesn't date, ever. She has seven orphaned siblings to support, and no time or money for socialising. Jack, whose besetting sin is his pride and whose downfall is his reliance on self rather than God, determines that he will win her over, regardless of the war, his friend Charlie's good advice, and Ruth's continued resistance. Sundin's second wartime inspirational romance set among the pilots of the U.S. Army Air Force stationed in England during WWII is an exceptional read, building on A Distant Melody (2010), but able to stand alone. A riveting tale based on the real-life adventures of her great-uncle, Sundin's novel features characters living large under emotional and physical stress, while the setting provides invaluable details and insights into the wartime mindset. Will a chance meeting in a time of war change her life forever? Never pretty enough to please her gorgeous mother, Allie will do anything to gain her approval--even marry a man she doesn't love. While Allie has nearly resigned herself to that fate, Lt Walter Novak--fearless in the cockpit but hopeless with women--takes his last furlough at home in California before being shipped overseas. Walt and Allie meet and begin a correspondence that will change their lives. As letters fly between Walt's muddy bomber base in England and Allie's mansion in an orange grove, their friendship binds them together. But can they untangle the secrets, commitments, and expectations that keep them apart? Book 1 in the Wings of Glory series, A Distant Melody is an exciting and tender story of love, courage, and sacrifice during World War II.